After dropping out of Stanford University five credits short of graduation, Will Ackerman collected $300 from friends and recorded an album of solo-acoustic guitar music called The Search for the Turtle’s Navel. He still hadn’t played a paying gig, but he’d begun to gather fans, passersby who’d heard him perform under an archway at the university’s Old Union building. At first, Ackerman split his time between music and carpentry. And Windham Hill grew slowly, releasing two albums in 1976 and one in 1977. By 1980, while roofing a friend’s house and recording George Winston’s solo folk-piano album Autumn—following releases by guitarists Robbie Basho (Ackerman’s guitar teacher) and Alex De Grassi (Ackerman’s cousin)—Ackerman decided to focus on music full time. That first Winston album made all the difference. Despite an absence of airplay, Winston helped Windham Hill find its natural audience, reaching surprising numbers of people who were looking for intimate, solo-acoustic parlor music so restful, so meditative it could simply become part of the atmosphere. That sound, which started with Ackerman’s own mix of Erik Satie and folk fingerpicking, soon became a musical movement. Then there was the time a friend physically grabbed Ackerman as he walked down University Avenue in Palo Alto and brought him to hear Michael Hedges for the first time. Ackerman famously offered Hedges a recording contract on a paper napkin. Thirty years after walking away from Windham Hill, Ackerman is still in Dummerston, Vermont, still building, still playing guitar, and still recording. New England Roads, released in 2010, is his most recent album of new compositions. Freed from the constraints of running a record company, he’s created an entirely new business model producing second-generation, independent acoustic musicians, backed by a rotating group of Windham Hill alums and state-of-the-art technology at Ackerman’s rural Imaginary Road Studios. Working closely with engineer Tom Eaton, Ackerman produced 15 albums in 2015 and 19 more this year. The best of this wave of solo guitarists—Lawrence Blatt, Todd Boston, Vin Downes, Raphael Groten, Trevor Gordon Hall, David Lindsay, Darin Mahoney, Todd Mosby, Matteo Palmer, Jeffrey Seeman, and Neil Tatar—owes a clear debt to the classic Windham Hill sound, creating music that would be unthinkable without the trailblazing recordings of Ackerman, De Grassi, and Hedges. But each is taking the acoustic guitar into new directions, too, exploring deeply felt, richly individualistic paths that are striking for their warmth, clarity, and vision. For Ackerman, working in the studio is like being a therapist, pushing musicians as far as they can go, holding them as they cry, and helping create a balance of vulnerability and productivity that drives the best studio performances. The young musicians working at Imaginary Road bear witness to Ackerman’s work ethic. In 40 years of building acoustic guitars, the acclaimed Froggy Bottom Guitars, of Chelsea, Vermont, has created only one signature model. That model was designed with Will Ackerman, who luthier Michael Millard calls a master. “As a player, a producer, and an engineer of acoustic music, there is simply no other individual who has ever had the impact on the listening public [that] Will has,” Millard says. In the summer of 2014, Trevor Gordon Hall went into Imaginary Road to record Mind Heart Fingers with Ackerman and Eaton. “I was super well-rehearsed,” says Hall, who plays a six-string guitar with a two-octave kalimba built into the lower bout. “I was going to be playing with Will, so I made sure my fingers were at the top of their game. And when I got in there, I realized I was entirely unprepared, because I really wasn’t present. Will and Tom have this very deep sensitivity to the intention of the player, making sure that every moment has a specific feel to it. That’s how they run the sessions, that’s how they mix, that’s how they master, that’s what the music is communicating. That changed the way I play forever, forcing me to get back to whether this music is something I believe in or just something I’ve rehearsed a lot. How does Ackerman describe his studio aesthetic? “My criteria have remained the same—namely, ‘Does the music move me?’” he says. “I certainly appreciate skill on the guitar, but more to the point for me is, ‘What do you have to say? Is it honest? Is it connected to something that will resonate with other people on an emotional level?’ Those are subjective judgments, obviously, but they’ve guided me well for over 40 years, so I think I’m pretty in tune when I hear somebody who is really telling me the truth. That’s still my primary criteria. In the middle of all the recording, there’s little time for composing, so when Ackerman is ready to write, he flies to Italy to spend a few weeks in solitude, doing nothing but improvising. It’s hard to imagine, given the beauty of Returning: Pieces for Guitar 1970-2004 (Decca). The album, featuring re-recordings of some of his best-known works, is a showcase for the dozens of ethereal open tunings he has employed over the years. Yet, Ackerman can go for months without picking up a guitar and years without writing a note. He doesn’t hear an evolution in his playing or in his approach, and in the decades since he began finding his style, he’s continued to create a new tuning for each composition, with only one exception—”Hawk Circle” (1980), which reuses the set-up from 1977’s “Anne’s Song.” He doesn’t understand why it works so well, but once he starts writing, Ackerman finds the feeling is still there: He grabs one of his main writing guitars, starts tuning and detuning the strings at random, and listens for the right note. If Ackerman follows those sounds on his upcoming trip to Naples, he might have an album of new material. But even though it’s been six years since New England Roads and 12 since Returning, he doesn’t seem concerned. “I have never seen guitar playing as my job,” he says. “Maybe it’s a game I play with myself, but I tend to see guitar playing as my avocation. My work has always been as a producer. I’m a better producer now than I’ve ever been; I know that for a fact. There’s not a regret that I have. I can walk across my front lawn, go into the studio, and work with all these people who keep coming back year after year after year. There are some indignities of age, God knows, but generally speaking, I’ve never appreciated life more. I’ve never appreciated people more. I’ve never appreciated the fact that I get to do this job more. 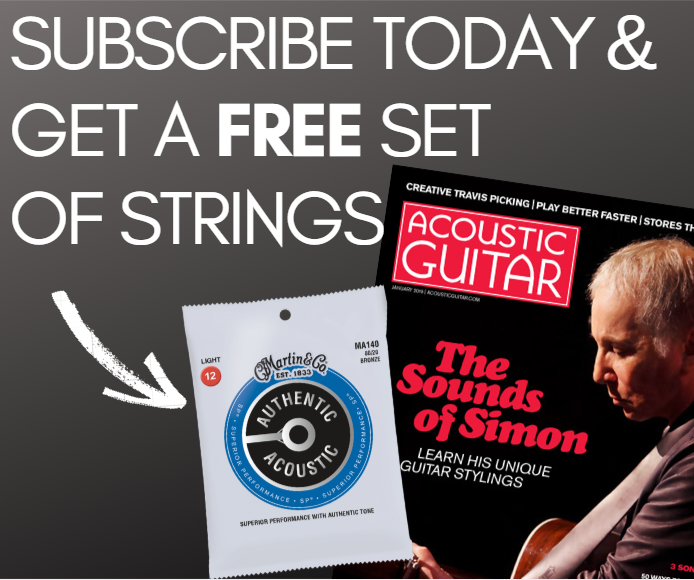 This article originally appeared in the November 2016 issue of Acoustic Guitar magazine.